One of the interesting ways to dress up an otherwise ordinary round watch is to add distinctive lugs. There are lots of examples but a great one is the 1957 Cadet. It would be a very plain watch if it wasn't for the unique see-through lugs. They remind me a little of lobster claws. 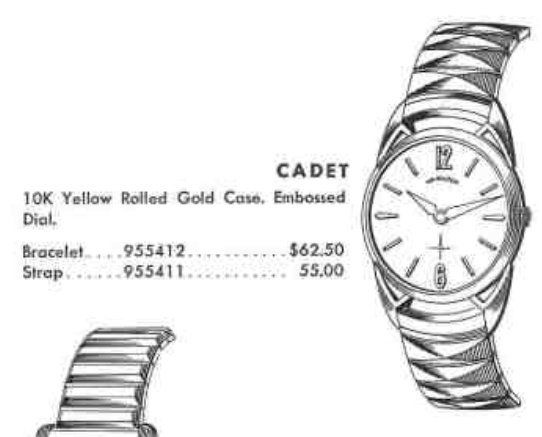 The Cadet came on a bracelet that celebrated the curve of the lugs or you could get it on a strap too. It was made for only two years, 1957 and 1958. The model is unique in that it's got a two piece rolled gold plated case. Most of the time RGP models had stainless steel backs - but not the Cadet. My Cadet project watch appears to be in decent shape. The dial has a milk-chocolate patina - which is odd since the watch has no lume. The crystal is a bit beat up, just replacing that will be a nice improvement. The back looks to be in good shape, especially since it's not stainless steel. The outside edges of the lugs are worn through though, but not too bad. With the bezel removed, you can see the dial is an older refinish. I can see that because the font for Hamilton isn't correct. It's also off center - typically the I is centered with the 12 and you can see it's a little too the left on this dial. Also, the word "SWISS" is a bit smaller than you'd expect on an original dial. The 673 movement inside is obviously dirty but it should clean up nicely after a trip to the spa. One of the dial foot screws are missing. There are only two so replacing this one will be a good idea. While everything is in the ultrasonic, I'll measure the old crystal and get out a new one to install later. My micrometer measures in inches so I need to multiply 1.140" by 25.4 to get millimeters. This watch has a low profile crystal so I'll try a PK style instead of a PHD that I typically use on models with sweep second hands. Everything is clean and shiny. I didn't clean the dial at all... I wouldn't be surprised if the printing came off if I tried to clean it. Refinished dials don't often respond favorably to cleaning. Now it time for reassembly. The 673 is a very straightforward design and relatively easy to reassemble. The watch is now running so it's off to the timer. Not too shabby. I'll leave it like this as it settles down. I'll take a dial foot screw from a parts movement. That will keep the dial secured to the movement. The watch looks fantastic with a new crystal and a fresh strap. The dial could be refinished to look like new but it's not terrible as is. I suppose the off-center Hamilton might drive you crazy if you looked at it long enough but other than that, it's a sharp looking watch - especially with those crazy lugs. Here's the same watch with a refinished crystal. It was definitely a nice improvement since the old dial was already an incorrect refinish. It's not usual to find uncased movements for sale. In fact, if you're really bored it's sometimes interesting to try to identify what model a loose movement came from. Typically they come from solid gold cases that have been scrapped. Sometimes you will find a movement and dial from a $2000 watch that someone scrapped for $250 in gold. Seeing that is sad, so I'm rarely bored enough to go looking for uncased movements for sale. One thing you don't often see is an empty solid gold watch case with a missing dial and movement. Now that really makes me curious. I recently had someone contact me about a family watch and all that he had was a solid 14K gold case, with crown and stem, and a very dirty Spiedel bracelet. 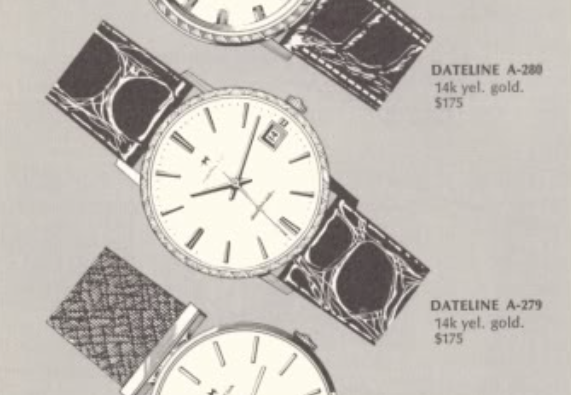 Initially I thought it would be easy to identify what the model the watch was, but it turns out that wasn't going to be the case (pun intended). Looking at the empty one-piece case I can see several important details. First, it's reeded around the perimeter. That's definitely distinctive. Looking at the stamped numbers, one of them ends with 66 so that's a good clue that this model is from 1966, even though it has a presentation on the back from 1969. The case back is pie panned shaped - so it was originally designed for an ETA movement like a 689, 694, etc. Armed with that info, the next thing to do is to look for models with those details. The best I could do was to find catalog images of things that are close. One is the 1966 Dateline A-279. It would have likely had a 694 movement. It appears to have some sort of engraving around the perimeter and the same straight lugs. 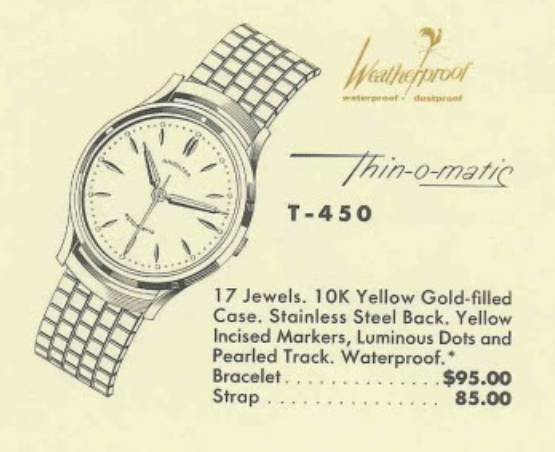 Another option was the Thin-o-matic T-210. It's case looks like a nice match too. Unfortunately, Hamilton didn't indicate what grades were in which models. 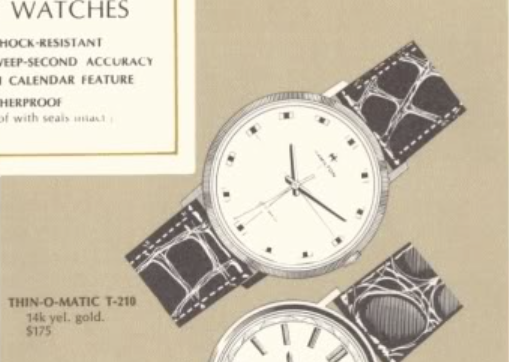 A Thin-o-matic could have a micro-rotor or a ETA movement like the 623 or 624. 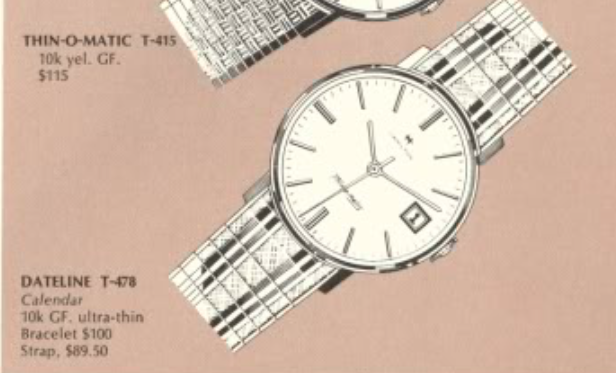 You really can't tell from the catalog what the back would have looked like and without a dial you're missing a lot of information. One thing is for sure, I'll need an ETA movement to go inside and a replacement dial. Getting a replacement dial isn't as easy as it sounds. It needs to be the right size (diameter) so even if I got a spare movement that came with a dial, it doesn't mean that I can use the dial. Typically the dial is the same size as the movement ring, or even a little larger. So I can use the movement ring that came in the case as a guide and not get anything too much smaller than the ring. Measuring the ring, I get about 29.8mm. That's pretty big, believe it or not. It took a while but one of my Hamilton friends had a spare movement and a dial that was almost the right size, 29.5mm. That would have to do. It's hard to tell from the blur in my photo but behind the dial is a 694A movement. It's not running but the balance looks good so I should be able to get it going after a good cleaning. Everything is cleaned and dried. I haven't lost any parts yet either. So far, so good. The 694 is pretty much like every other ETA automatic and goes together fairly smoothly. Now the watch is running with good motion so it's off to the timer. It's a little noisy so I'll reclean the hairspring and make sure any rogue pieces of dust, etc. are removed. That's much better. I will fine tune the beat error and the beat rate to get it even better. There... not too shabby and pretty much right on the money. A new crystal and alligator strap complete the restoration. The dial that I got was a little worn but it's not as bad as my camera makes it out to be. This isn't the correct dial for an A-279 or a T-210. I think it's actually from a 1964 A-675, but that's just a guess. In the end, it doesn't really matter. Another family watch has been saved and the owner can enjoy wearing his dad's watch again, even if it is just the original case.